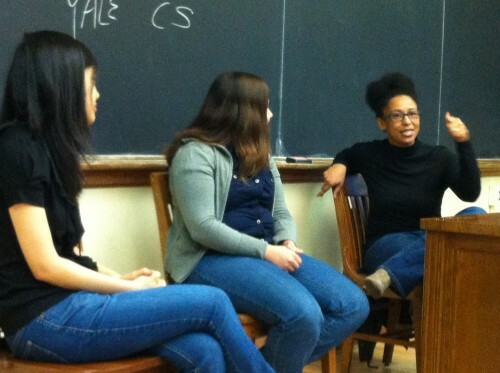 On December 8th, while students on campus buzzed with anticipation for the night’s holiday dinner, Yale female undergraduates, graduate students, and professors in William Harkness Hall buzzed with anticipation for a different reason: the start of the Second Annual Conference for Undergraduate Women in Science and Engineering at Yale (UWISAY). 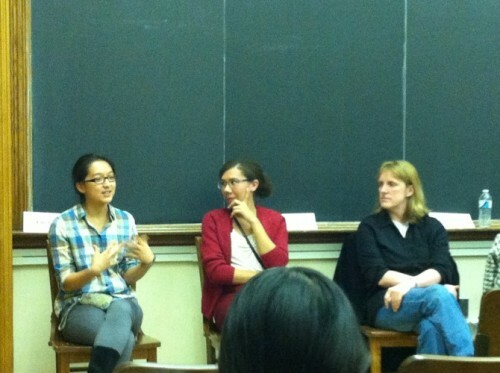 The UWISAY conference featured an exciting day of panels, each discussing a unique topic relevant to female students contemplating a career in science. Start-Ups Panel. 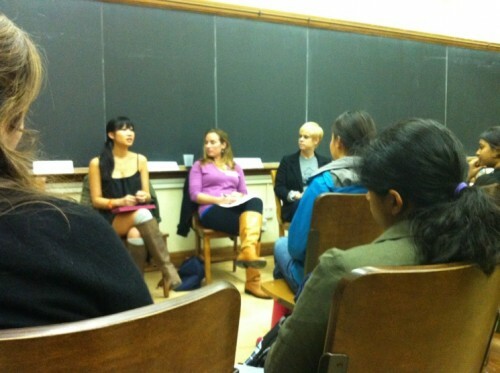 From left to right: Keila Fong (Senior, Co-President of YEI Idea Institute), Alyssa Siefert (Biomedical Engineering Graduate Student, TA for New Product Development and Creativity class at Yale), Alena Gribskov (Programs Manager, YEI). Courtesy of Molly Patterson. Science Research Panel. From left to right: Linda Zhou (Junior, undergraduate research with rainforest lab), Louise Edwards (Lecturer and Researcher, Astronomy Department), and Helen Caines (Professor, Physics Department). Courtesy of Molly Patterson. Eight lively panels filled the rest of the afternoon, addressing topics such as non-traditional career paths in the STEM fields, life as a graduate student, and how to get involved in start-ups at Yale. In one panel, several seniors planning on starting careers in the sciences examined their four-year journey and provided attendees with advice on the challenging task of balancing scientific ambitions with artistic and athletic passions. The desire of all the panelists to inspire and support the attendees was evident as numerous panelists took the time to talk with students individually after the discussions. The day rounded off with an activities fair, where representatives from organizations such as the American Institute of Chemical Engineers and Club Geo provided more information about how to get involved in extracurricular scientific opportunities on campus. Engineering Research Panel. From left to right: Connie Wu (Senior, undergraduate research in chemical engineering), Karen Dannemiller (Graduate student, Environmental Engineering), Anjelica Gonzalez (Professor, Biomedical Engineering). Courtesy of Molly Patterson. Molly Patterson, UWISAY Conference Chair, commented on the impact of the event, “The undergraduate attendees today were hopefully inspired to continue pursuing their scientific passions after hearing success stories from the female science and engineering role models on each panel.” The conference was aligned with UWISAY’s mission, which is to support the community of women at Yale interested in science, technology, engineering, and math. With an inspiring speaker and informative panels, the Second Annual UWISAY Conference was a clear representation of Yale’s supportive environment for aspiring female scientists.